Hôtel Château-Bromont provides a highly elegant and contemporary setting. The well-appointed luxurious surroundings, including features such as the Amerispa and the culinary delights of Les Quatre Canards restaurant, promises unlimited pleasure. Nestled in a dream location, Château Bromont is sure to offer quality and satisfaction. 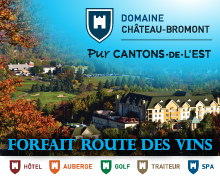 Domaine Château-Bromont offers Wine Route packages giving you different choices how to visit the wineries. Starting at $121 per person in double occupancy.